Hey all! It’s been awhile! I got a new job recently and it’s been super rough over these holidays so I haven’t had the time to write but I’ve been having a LOT of fun with Kobolds and Catacombs! Lots of fun new decks to play around with. Today I’m bringing a deck guide for one of the more popular ones, a combo deck that is being called “Cubelock”. The deck involves a bit of Control and a Combo that uses demons and Carnivorous Cube to make lots of copies and go crazy with them. If you like Doomguard , you’ll love this deck because you’ll average like 4-5 per game, haha. This is one of the better performing decks currently so if you’re looking for something to grind Rank 5 or Legend with, this is your deck! It’s a bit costly if you don’t already have some of the older pieces but if you can put this deck together it’s well worth the cost. Spiritsinger Umbra is kind of an extra piece that isn’t needed so if you don’t own it, don’t worry. Even Skull of the Man'ari isn’t REALLY needed if you’re struggling that much for dust, because I’ve played the deck without it and it still seems to work okay with just Possessed Lackey getting your demons into play. So if you’re struggling for dust/legendaries, still check this deck out and maybe throw together a budget version and let me know how it works out for you! So without further delay, let’s check out a great deck from the new meta, Cubelock! Setup: First part of the combo is setting up the minion. You do this by either having a demon in hand with Skull of the Man'ari or have a Possessed Lackey that can go get a demon from your deck. Drop one of these on Turn 5 and you’ll be good to go! These are the cards you need to try and mulligan hard for, it’s okay to keep a few of the early game stuff like the support minions but if you want to have a smooth game, you need one of these setups to pop off. 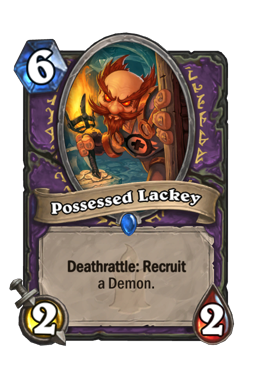 Possessed Lackey : This is the guy that is going to fetch the four demons if they are inside of your deck and not in hand. 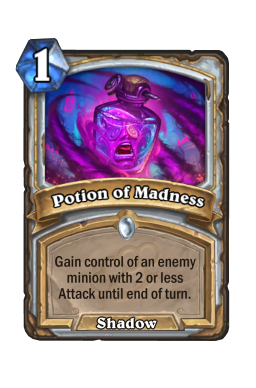 You can combo this on Turn 6 as well with Dark Pact if you’re afraid of Silence or something like Priest using Potion of Madness against it. People will know that you’re trying to get your power demons so if they have ways to stop it they will, the best way to guarantee it is with Dark Pact . If you’re playing something like Druid or Hunter though, you’re probably fine to play it on curve, Turn 5, and get your free demon to set up for Turn 6. 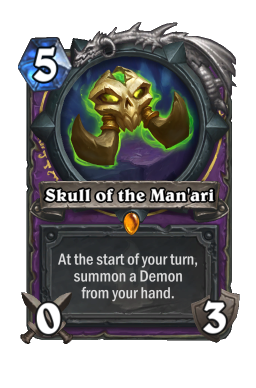 Skull of the Man'ari : Skull is probably the best way to combo off but the hardest to set up since you have to have Skull and also one of the good demons in your hand, for me really only Doomguard matters unless you’re playing aggro then Voidlord is actually okay but we’ll get into that in a bit. This setup for the combo allows you to know which demon you’ll probably get into play so you can calculate it better and also doesn’t require your Possessed Lackey to die which sometimes can be hard to do. Demon: The next part is getting one of these two demons into play, best case scenario, on Turn 6 after one of the setups on Turn 5. 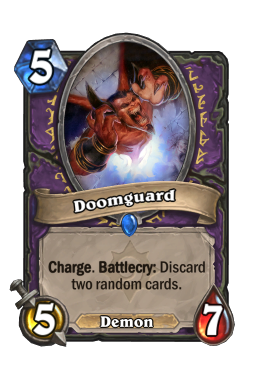 Doomguard : Doomguard is usually your best bet in any situation because of the free Charge attack and the high health. They’re also better to get killed for Bloodreaver Gul'dan to revive so getting them out early instead of Voidlord is good. Voidlord : Voidlord is just a great defensive card. Against aggro it’s almost a guaranteed win because of how much life/defense it gives you. The 18 damage it negates is like gaining 18 life in a way. Even against non-aggro decks it’s still a good minion that allows you to attack for some damage and if there’s a board wipe, it turns into small guys that still attack. The ONLY thing I don’t like about this demon is Bloodreaver Gul'dan . The voidwalkers he makes are demons too so when you drop your Death Knight, you’re going to revive a lot of 1/3s instead of the better Doomguard choice. I try to only toss these out against aggro but sometimes you can’t help it, and RNG pulls him from the deck instead. Still he’s a better choice than any other demon. Finisher: These are the cards that go with the demon to produce tons more demons for you to attack with, defend with, and then bring back to life with Bloodreaver Gul'dan . Carnivorous Cube : This is the best finisher to the comb if you can combine this with Dark pact but even without, it’s still pretty strong. I usually only like to use this with Doomguard but if you're desperate for the health, sometimes Voidlord is okay too if you have no other options. Usually though, you attack with Doomguard , drop this down and eat it, then sacrifice it to Dark pact and gain a bunch of life while also getting 2 more Doomguard s back to attack again. The best part about this combo, it gives you a lot of dead Doomguard s that come back later when Bloodreaver Gul'dan hits play. 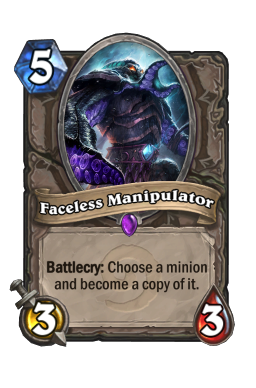 Faceless Manipulator : This is a more guaranteed thing, kind of like how Skull is more guaranteed than Lackey since you don’t have to get it killed, if you don’t have Dark Pact to use with Cube, you can still copy a Doomguard and have two 5/7s charging, while also adding another dead Doomguard for Bloodreaver Gul'dan . 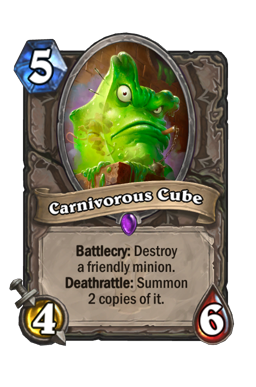 The ULTIMATE combo though, is getting a Carnivorous Cube to eat Doomguard then copy the Cube so that you get a ton of Doomguard s back. Honestly though it’s a bit of overkill, I prefer to just use Manipulator to copy a demon in play and not try to go crazy with Cube copying. It’s fun to do at easier ranks though so don’t be afraid to play around! Helpers: These cards aren’t really necessary to get the main part of the combo but they help make things better and smoother. 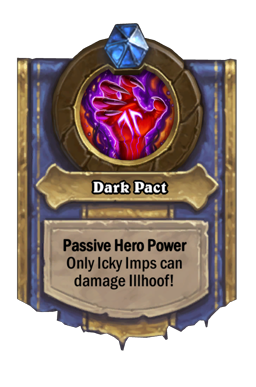 Dark Pact : This is your free Deathrattle trigger when you need Possessed Lackey or Carnivorous Cube to activate on the same turn. This will help play around stuff like Silence or Potion of Madness or Sap which will mess up your combo. If you know your opponent is running that stuff, make sure you have Pact to have everything go off smooth. 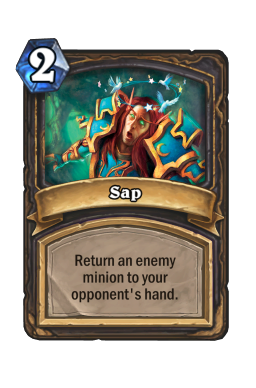 This card is also super great against aggro because out of nowhere you can gain 8 life and keep yourself from lethal damage. By itself the card isn’t that great but it’s a great combo card. 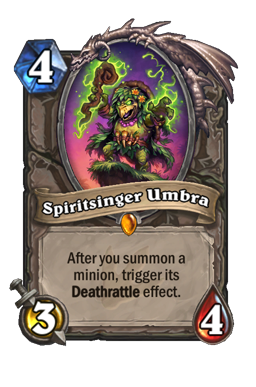 Spiritsinger Umbra : This card is kind of like Fandral Staghelm if you’ve played Druid before because there are 2 ways to try and get him to work. 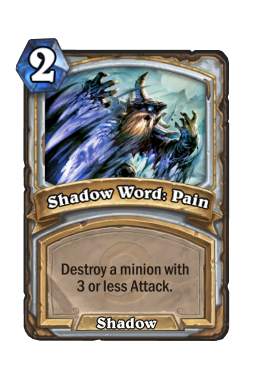 You can risk playing him early like on Turn 4 to get a Turn 5 Possessed Lackey activation but obviously you’re risking him dying to something like Shadow Word: Pain . Or, my favorite way is to play him on Turn 9, 4 mana for Umbra and then 5 mana for Carnivorous Cube to kill a Doomguard and get 2 back immediately. If it’s Turn 10, you can even use the last 1 mana for Dark Pact and get 2 more Doomguard s back for a total of 4 attacking. You don’t need it for the combo but it can totally make things explode into craziness. Warlock has a great toolbox of removal spells that can both kill pretty much any field and also gain you life at the same time. 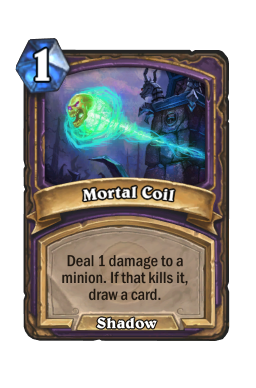 Mortal Coil : Basic early game removal, use it on something to draw a free card and get into your combo pieces. You can also use this to set up for a Defile if the health needs to be set up just right. 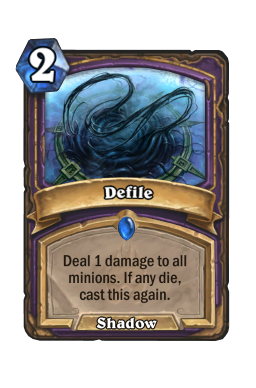 Defile : Great board removal for aggro decks, not much else to say besides that, use it to cheaply remove the field. I guess you can combo it with Kobold Librarian since it has 1 health to kill 2+ health armies like Living Mana . 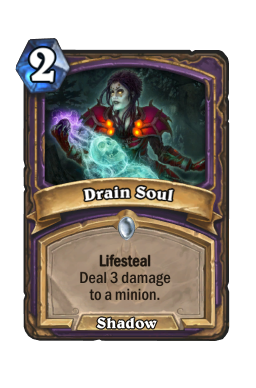 Drain Soul : I only have 1 of these in the deck and honestly you could replace it with a few other things, like Mountain Giant if you like that card. I just like the extra removal for aggro as well as the gain life. 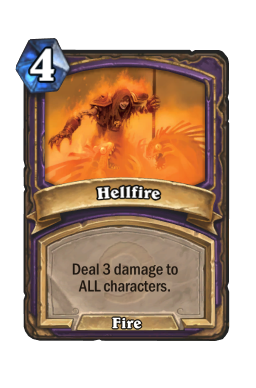 Hellfire : Awesome board removal card that helps make your Lesser Amethyst Spellstone do more damage and gain you the life back, basically. Also can sometimes set up for Defile against a lot of high health minions. 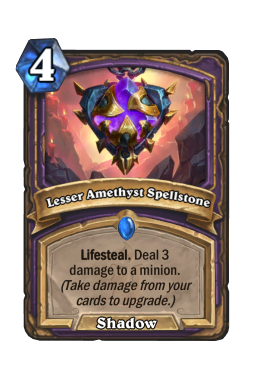 Lesser Amethyst Spellstone : Great new removal spell that showed up in Kobolds and Catacombs which increases in damage and life gain whenever you take damage from your own stuff. Kobold Librarian and Hellfire are the only two ways to increase them so sometimes I like to keep a Kobold Librarian in hand and use my Hero Power that way I can quickly activate these when I draw into them. If you play a Kobold Librarian and draw into one, it will activate as soon as you draw it into a 5 damage version! 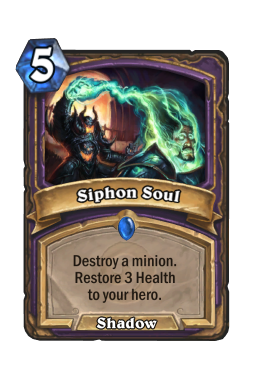 Siphon Soul : I believe this is another change that I made to the deck from another version that uses Mountain Giant instead. 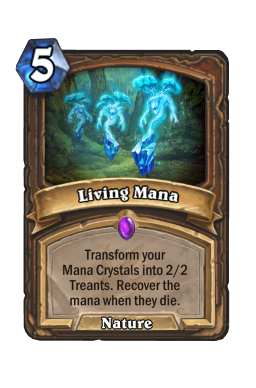 Right now I prefer the large removal as well as the extra life gain, it helps against big minions which keep showing up in Priest decks and also in the mirror match against big demons. 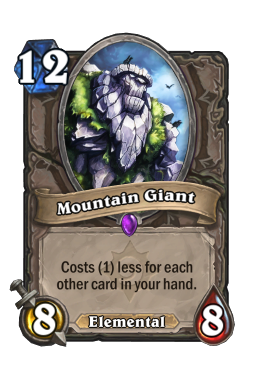 So far it has served me well so I'm keeping it in for the time being, I'm just not a fan of Mountain Giant in this deck. These are the leftover cards of the deck, a few early game support minions that handle aggro while helping draw your deck and of course the best finisher for any demon-based deck, Bloodreaver Gul'dan . 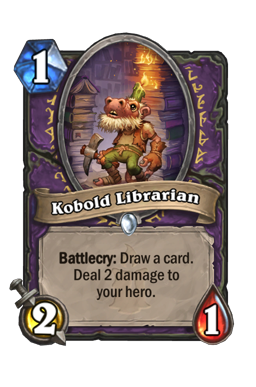 Kobold Librarian : A great early game minion but I usually like to save them for Lesser Amethyst Spellstone . 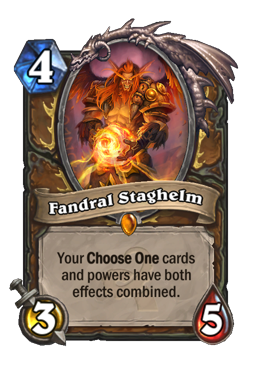 If I have one in hand, I'll play him right away, but usually I prefer to just stick to my hero power. 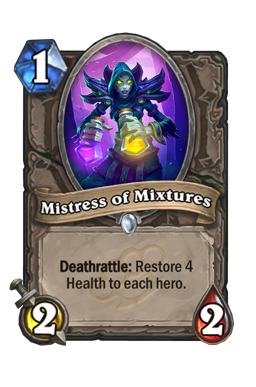 Mistress of Mixtures : Probably the best early game minion since it allows you to start hitting your hero power right away and gain the life back, or fight against aggro while you're using your hero power. Just a great early game card for this deck. 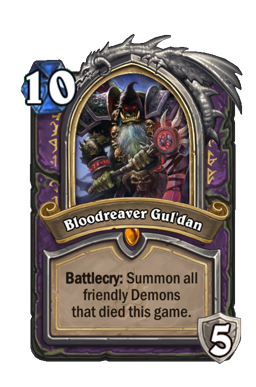 Bloodreaver Gul'dan : Any demon-based deck is going to use this card as a finisher since it brings all your big guys back while also making your hero power do some insane damage and life gain. The tough part about this deck is that sometimes your Voidlord will get into play before the Doomguard s and get killed, making all these voidwalkers that get revived as well. 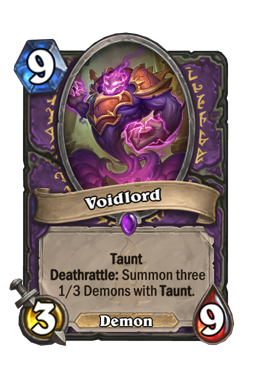 I've had a long game where I played Bloodreaver only to have 6 voidwalkers and a Voidlord come back. AAECAcn1AgTJwgKizQKX0wLb6QINkwT3BLYHxAjMCN7EAufLAvLQAvjQAojSAovhAvzlAujnAgA= To use this code, highlight that string of letters/numbers and then right-click and Copy or press Ctrl+C to copy it to your clipboard. Then go to create a new deck and Hearthstone will ask you if you want to create a deck using your clipboard and it will autofill the deck for you! I originally started playing the Kingsbane Rogue deck that was going around that uses Mill Rogue cards, but that deck is very inconsistent and I wanted something that could grind really well at the end of the month. Even with how busy I was with work, this deck still got me to Rank 4 and made sure I got my golden epic from the end of the month rewards! I'm a big fan of combo decks and I think they're the best type of deck for me so if you're the type that likes searching for combo pieces and making them work together in weird ways, this deck will be a lot of fun. There are a lot of weird things you can do with the Cubes and Umbra and Death Pacts. Well that's pretty much it for me! Thanks for reading, as always follow my activity on Twitter at @whoisfuskee and sometimes find me on stream at twitch.tv/whoisfuskee. I haven't been on lately because of my job but I'm hoping sometime this month I'll be able to stream a bit again. Follow me and get notified when I hop on, I like it when I have people to talk to! I'm going to try and keep on top of writing a deck guide here and there so keep an eye out for my next one. See ya!